Boing! Boing! Nope, it's not Tigger the tiger, it's Muttagen's Jenga! Jenga-J-J-J-Jenga! Mom usually calls me Jenga-Juice, Baby J or Yubby. I was born near San Francisco, California on January 14th, 2011. I'm a mix of malinois, border terrier and border collie. I live in Chilliwack, BC with my humans Sheri and Jonathan, and canine siblings Ping, Savvy, MoJo and Salem. 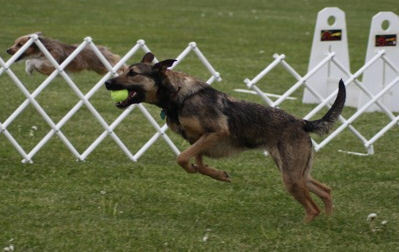 Mom was already hooked on flyball long before I came along, so there was no question that I would play too. Our biggest training challenges have been my ball obsession and my striding; I love to leap sky high over any obstacle put in my path (or even just for the heck of it!) so Mom has had a hard time getting me to run low over the jumps. Everything else about the game has been super easy for me to learn. The first weekend I ever did warm-ups in a tournament was the same weekend I learned to pass a dog in the lane, and I debuted and ran clean! I'm still getting comfortable in the race lanes, but have already run a best time of 4.34 seconds in the pack! 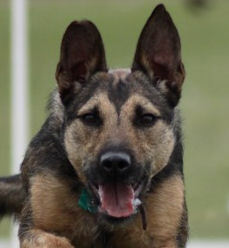 Outside of flyball, I also do disc, nose work, ringsport, scootering and dock jumping - well, pretty much anything Mom & Dad think will be fun to try! All that fun stuff will tire a girl out, and that's when you'll find me snuggled up on the couch or warming the bed.